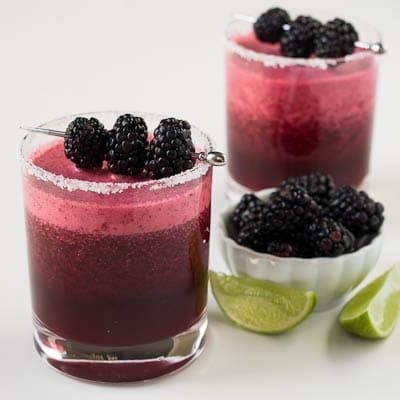 With a week of what looks like cold weather ahead of us, I thought it would be nice to have a little summer preview in the form of a cocktail- Blackberry Margaritas. We get really enormous, plump, juicy blackberries around these parts in mid-summer. While they’re not my favorite berry, I greatly prefer blueberries, raspberries, and strawberries, I do like to experiment with them in recipes. Of course anything is going to taste good when mixed with tequila. At least in my opinion. But these margaritas are fantastic. And you have to love the beautiful, jewel-toned color. They turned out on the sweet side, but if you want to make them less sweet you can always add more lime juice or more tequila. I vote for more tequila! Combine 1 1/2 tablespoons of sugar and 1/2 teaspoon kosher salt on a small plate. Rub a wedge of lime around the rim of each glass and dip in the sugar/salt mixture. Combine water and 1/4 cup sugar in a glass bowl and microwave for 30 seconds to 1 minute. Stir to dissolve sugar. Let cool. 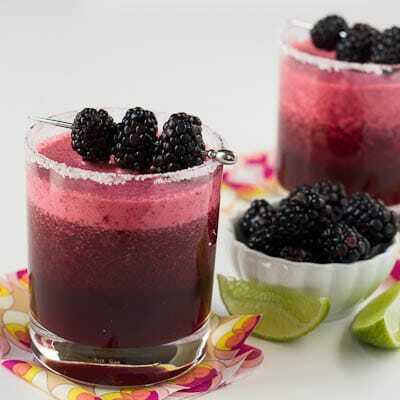 In a blender, combine syrup, lime juice, tequila, Grand Marnier, and blackberries. Process until smooth. Strain mixture through a fine-mesh sieve into a small pitcher. This entry was posted in Cocktails and tagged blackberries, margarita, tequila. Bookmark the permalink. Amazing. Try this with jalapeno tequila! The best. don’t matter what flavor the margarita is, i love them ALL! Yesssss!!!! Blackberry drinks are my very favorite thing!!! Pinning, and definitely trying soon! These look so good! 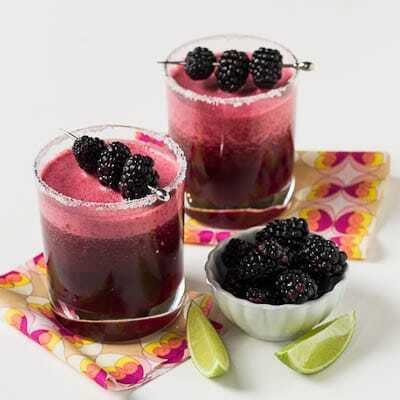 Fresh blackberries, blended with tequila, grand marnier, lime juice – what can be better in a drink? Pinned!! I’ve never had a blackberry margarita. I must change that ASAP! What a nice and bright margarita!